Negative Talk Is Not Always a Bad Thing. My job as K-5 Math Specialist has many facets (too many sometimes) but luckily, a few times a month, I have the opportunity to teach an incredible group of 4th grade enrichment students. Last month we were playing a fraction game called “Pot of Gold” in which students were adding and subtracting fractions using pattern blocks based on the fraction they rolled on a die. The game typically ends when a student has lost all of their “gold” (pattern blocks) and the person with the most wins. In one group a student had a trapezoid left in hie pile (1/2 of the hexagon whole) and he rolled ” – 6/8.” He should have been out of the game because he didn’t have 6/8 to subtract from his pile, instead he asked me if he could just have negative 2/8 and try to “earn it back.” I asked the group what they thought and they were all on board so the game continued with the students going back and forth from positive to negative fractions, earning and owing as they went. That comment opened the conversation up to negative numbers and unfortunately we ran out of time that day (isn’t that always the case?). From that point on, every time I saw one of them in the hallway they kept asking (hounding) me to come back and do something with negative numbers. 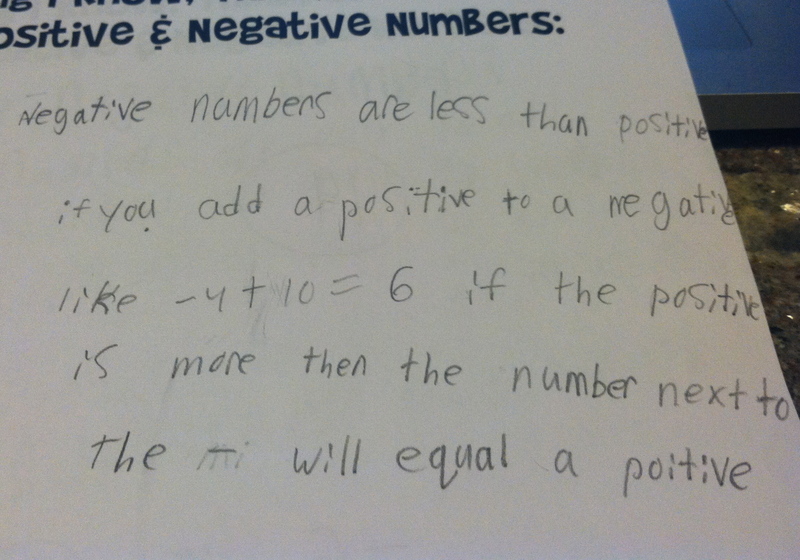 I love when students are begging to learn math, how awesome! I scheduled my time with the teacher and then started to plan, it was much tougher than I thought! The class is a mix of students ranging from those who had a handle on what a negative number is and others who did not. I was worried about some forming “rules” and others, who did not have a good sense of negatives, memorizing them without understanding. I was stressing because I am a bit type A with planning, but I decided to take the pressure off of myself and just let them own this conversation. I could not be more happy with my decision! I cannot even describe how awesome this conversation was, students were asking and answering each other. I had my phone out, looking up answers to questions like, “When and why did negatives come about?” and “Are there negative Roman Numerals because IV for 4 seems like a negative?” We were ALL learning! I had another group to teach and had to leave, so we quickly talked about midpoint being the middle of two numbers (of course one student yells out “median”… I love this class) and I left them with this tweet. Where would you go next with this group?? I loved the comment in the brainstorm that said, “Positive number – the higher the number, the higher the value. 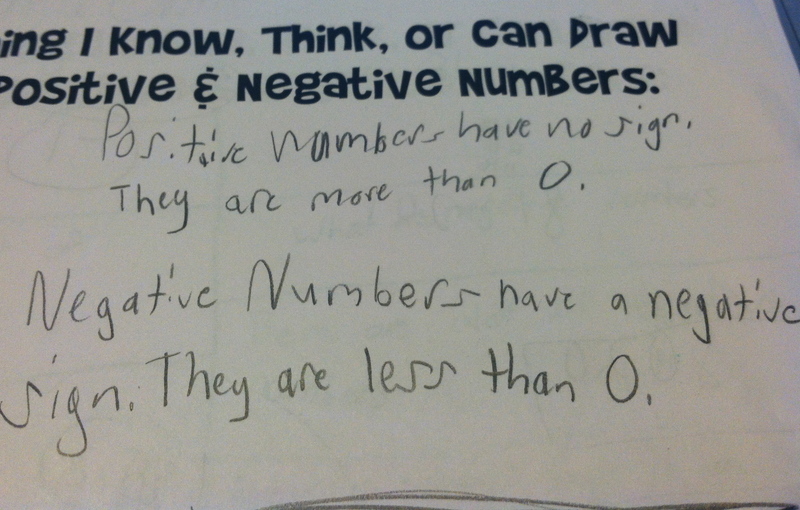 Negative number – the lower the number the higher the value” Hmmmm…do we get into absolute value? 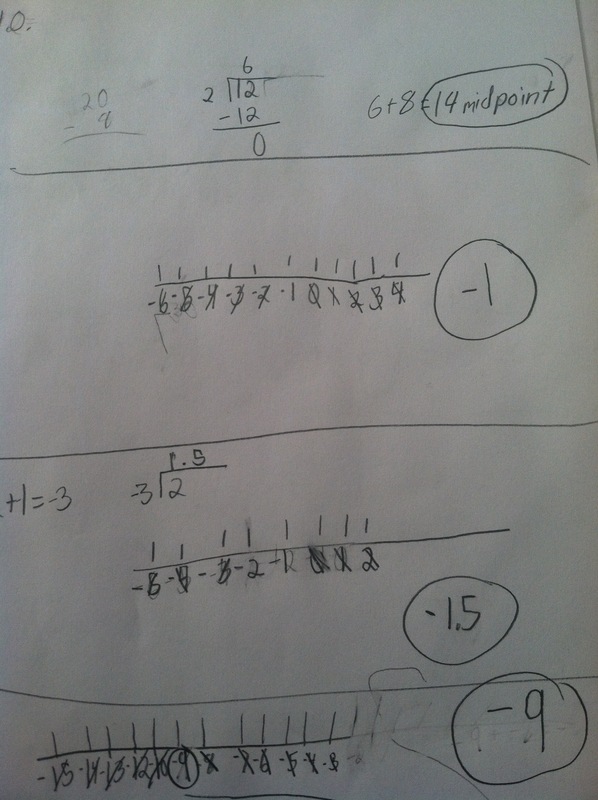 I loved their strategies for midpoints…most used number lines, some found the distance between, divided in half and added to one of the numbers…do I keep going with this? 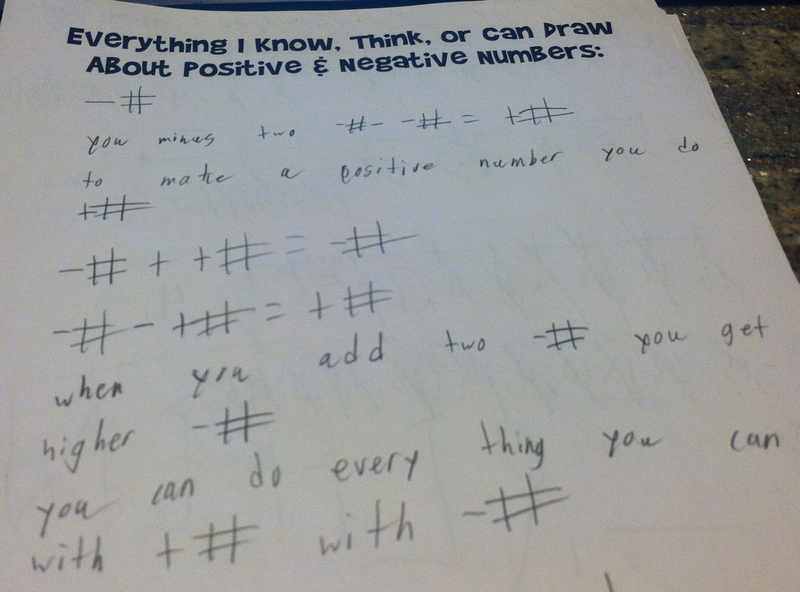 They also questioned a lot about addition and subtraction of positives and negatives…do I focus on this with the number line being the model? So much information out there in one short lesson….but what I really learned from this lesson, was sometimes the best plan is to not really have a plan. Let them lead, let them talk, let them be in charge of their learning and they will open up more learning opportunities than you can imagine! 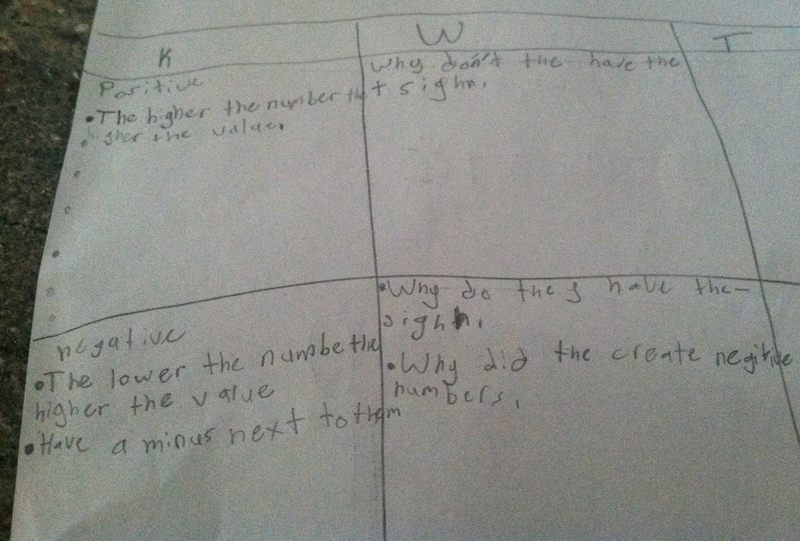 This entry was posted in Integers, Math, Uncategorized and tagged 4th Grade, Integers, Math, Negative Number on May 11, 2013 by mathmindsblog.